I know what you’re thinking: ‘that has to be posed’. 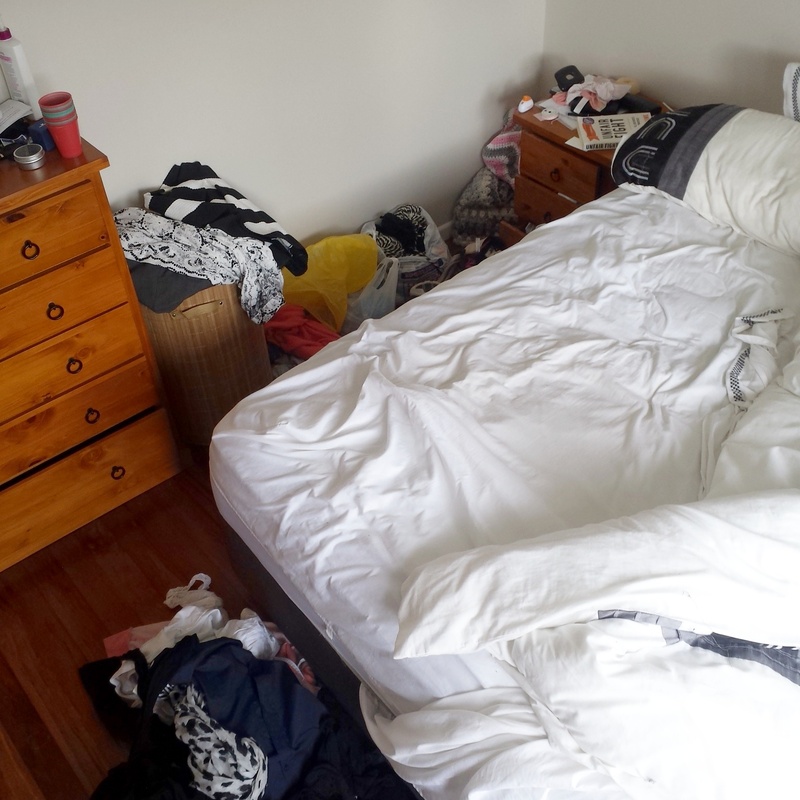 No, not by one of those professional stylists you hire when you’re trying to sell your investment property, you just don’t believe that I could throw the covers back with reckless abandon and then not return to make the bed. I’m not a bed maker. My mum’s a bed maker, my dad’s a bed maker, my sister’s a bed maker, but there’s gotta be a coupla recessive bed making genes in there, because I am definitely not a bed maker. Boyf is a bed maker, and for the first few months, he did gently suggest that I might like to make the bed, but then he gave up. I know Mum takes it personally that I don’t do bed making, feels like a failure, like she didn’t raise me right, but Dad feels more disappointed about my inability to change the oil in the Mazda, or add water to the window washer things. So that’s the bedding – it’s not designer. It’s from Briscoes. It was on sale. I know it’s very rare that they have one, guess I just got lucky. Those are bedside drawers beside the bed. Not a funky wire basket with a concrete top, or a stool looking side table with dipped legs, it’s not an industrial side table with castors, or a curved ply cubby table – just your classic bedside table with three drawers. Sitting atop this piece are a menagerie of items. Coupla pairs of knicks (clean) that have lost their matching bra (how does that even happen?!? ), there’s two hole punches: a generic and a heart. There’s some string, some pieces of card (there was a guillotine there for a number of weeks). There’s a book that I’m not reading, a hair donut and a few other items that I can’t make out. In the corner are some completed crochet projects, and beside them is a bag of yarn that hasn’t quite made it to the garden shed yet. Yes, my yarn has been relegated to the garden shed. There’s a pile of miscellaneous clothes that don’t have homes, and a washing basket, which is a new addition thanks to Kmart. Atop the washing basket are some items that I don’t know what to do with. One of them is the skirt we wore when hosting at work two months ago (I hope there was no urgency to return that). You’ll notice at the foot of the bed that there are more clothes. Those poor misplaced, unloved items of clothing get picked up most mornings and laid on the bed, only to be kicked off in the night. I’m not sure if you noticed the lack of lamps, but yes, when I turn off the light I do trip over the crap beside the bed. I know it’s hard to believe, but this is actually a vast improvement on what the boudoir looked like when I arrived. The bed’s new, and there was a black duvet with a black valance and two flat (very flat) pillows in black pillow cases, the sheets were navy blue. When we move into our five bedroom, three bathroom house in a good school zone, with a pool and a spa and excellent indoor/outdoor flow, we might splash out and get a snippet of the lyrics of “our song” in brush lettering (A0), framed above the bed. Just kidding, we don’t have a song. I’m like you too. Your boyfriend is the very worst kind of bed maker. He’s a ‘tell my girlfriend to make the bed’ bed maker. I’m glad he’s given up trying to change you. We’re born this way.